Knowing what my son wanted this year has been fairly easy, he sings the catch phrases or tells me when he sees a commercial that he likes it. 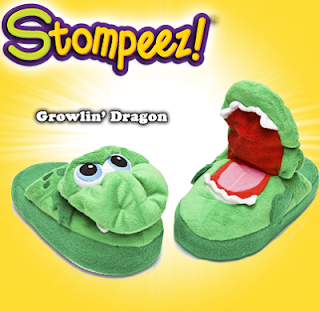 Last year it was Pillow Pets, this year its all about Stomp Stomp Stompeez. He even asked Stompeez Please. Too cute! Last year that had such an overwhelming demand they ran out! But this year they have a new plan and tons of inventory for all the good little boys and girls that want Santa to bring them Stompeez. Have you seen the commercial its very catchy. They show the kids stomping in the cool slippers and say Stomp Stomp Stomp Stompeez! I have even seen Stompeez showing up at some retailers. For my son I picked the Growlin' Dragon. My son thinks dragons are super cool. He loves this slippers. 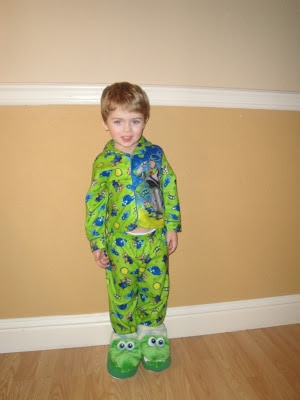 He stomps all over the house making his Stompeez growl at me. They have even munched on a few toys. My son will stick a action figure in the Dragons mouth and make the slipper bite it. It hilarious! You do need to stomp in the slippers to get them to work. My son had to learn to stomp properly to make the mouth open. I am sure older kids will have no trouble at all. My son immediately knew what they were. He yelled Stompeez and put them on to stomp. He wears them in the house every day and I have let him wear them to run errands. He had them on in the grocery store cart the other day and a few people asked me where to get them. Some kids recognize them too. They are a super cute gift for the kids in your life! Most kids under 5 will wear a small. 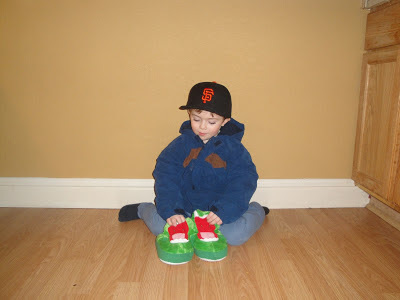 My son is 3 with big feet and he still has room on the back of the slippers to grow into them. You can buy Stompeez online and get great deals. 2) Customers who order two or more pairs at StompeezClub.com enjoy free same-location shipping on the additional pairs (after S&H paid for 1st two pairs). Perky Puppy is so cute! I would pick the Unicorn! My boys would probably like the dragon one best. My little man would love perky puppy! I would choose the Growlin' Dragon. Thanks! I'd pick the Growlin' Dragon. I really love the Purple Playful Puppy! playful puppy or the unicorn! so cute!